Is this the 2014 BMW M4 Convertible? An alleged official image of 2014 BMW M4 Convertible has surfaced online. 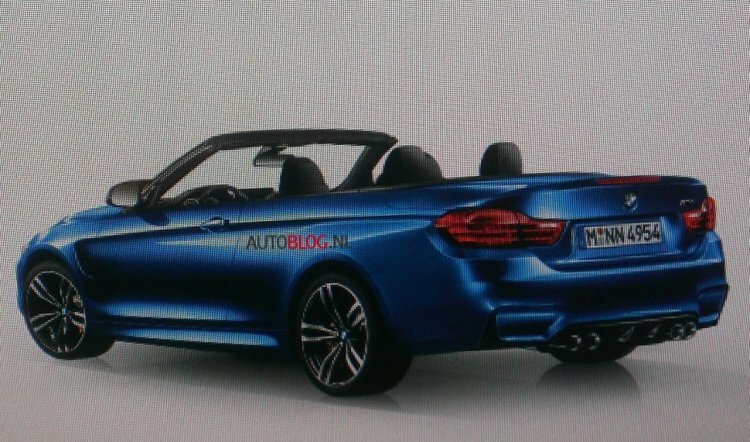 Autoblog.nl, who uploaded it, claims that it has been obtained from a German brochure. Is this the convertible version of the high performance BMW M4? From the image we see that the 2014 M4 Convertible receives a new rear bumper with an integrated diffuser along with a quad exhaust setup. Other changes compared to the regular 4 Series are the new side skirts, alloys and the modified front fender. While this could be the real deal, there is a fair chance of it being another real-looking rendering. The angle of the front wheel placement, for instance, seems to be a bit jagged. Even if it is not an official pic, the end product would be really close what is shown here. The M4 Convertible will be powered by a new 3.0-liter TwinPower Turbo six-cylinder engine which will develop 430 HP and more than 500 Nm of torque. The new model is said to be faster and more fuel efficient than its predecessor, as many weight saving measures have been adopted.